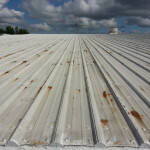 Restore Your Metal Roof for a Fraction of the Cost of Re-Roofing! 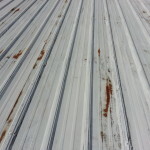 Even New Metal Roofs have Weak Points for Water to Penetrate through like Seams every 3 feet continuously. 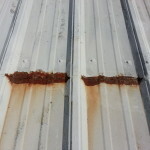 We Seal all Seams on Your Roof and Eliminate these Weak Points. 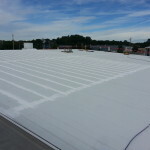 Our Restoration Systems Make Your Roof Seamless and Monolithic, Fully Reinforcing and Sealing Your Roof from Potential Water Penetration. 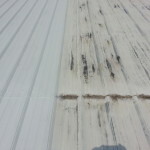 Most Roof Flashing offers opportunity for water penetration. We Seal all Flashing with fully adhered material that leaves no opportunity for water penetration. Fasteners loosen over time due to thermal shock. 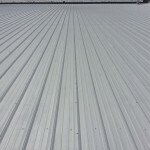 After replacing loose fasteners we fully seal them with a coating that greatly reduces thermal shock and prevents water from accessing the fastener hole. 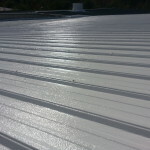 We address any existing roof repairs to ensure they will not be a problem in the future prior to coating. 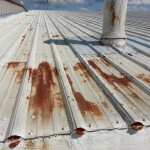 Our Prep process involves removing rust and sealing the roof with rust inhibitive primer to avoid future rust issues. 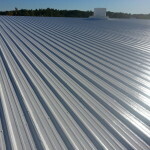 Thermal Shock occurs when the sun heats up the roof surface and expands the roof. Then a rain instantly cools the roof and causes it to quickly contract. 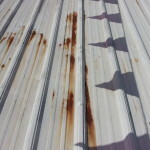 This movement is responsible for leaking fasteners and seams and flashing. 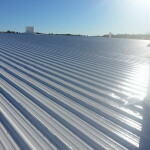 We Greatly reduce thermal shock with a roof coating that stabilizes roof temperatures in the mid-day sun.